Roller sleeves are designed to stay on the rollers, but they don't always, and that can have messy consequences. As the sleeve inexorably separates from the roller while you paint, you have to stop what you're doing and push it back. You can do this with your bare hand or with a rag; you can push the end of the sleeve against the bottom of the paint tray and risk upsetting the tray, or you can push the sleeve against the surface you're painting and make a round mark that may be visible after the paint dries. Here are a few ways to prevent the problem altogether and stop the roller sleeve from creeping when you're in the middle of a job. When the roller sleeve creeps off the roller, you could have a mess on your hands. Paint rollers have a series of three or four spokes -- or tines -- each with a slight outward bend. The tines are designed to wedge against the sleeve and keep it in place. When they aren't doing their job, you might be able to adjust them, as long as they are made of metal. Just pull outward on the middle of each tine with a pair of pliers. You can't do this if the tines are made of plastic, because plastic breaks. Another way to secure the roller sleeve to the roller is to wrap something around the roller tines to make them fit more tightly inside the sleeve. Three-mil sheet plastic works well, and if you're using plastic dropcloths, you have plenty of this material available. Just cut a small section from a dropcloth, and then wrap it around the roller and force the sleeve back on. If the sleeve continues to slip, wrap more plastic until it's secure. The roller sleeve will stay put if you glue it to the roller tines, but you don't want the sleeve and the roller to be permanently mated. However, if you use mucilage -- which is the glue that schoolchildren use to glue pieces of paper together -- you should be able to pull off the sleeve with a good tug once you're finished painting and you've cleaned the roller. If it won't come off, douse the roller in water. Mucilage is water soluble and will dissolve. 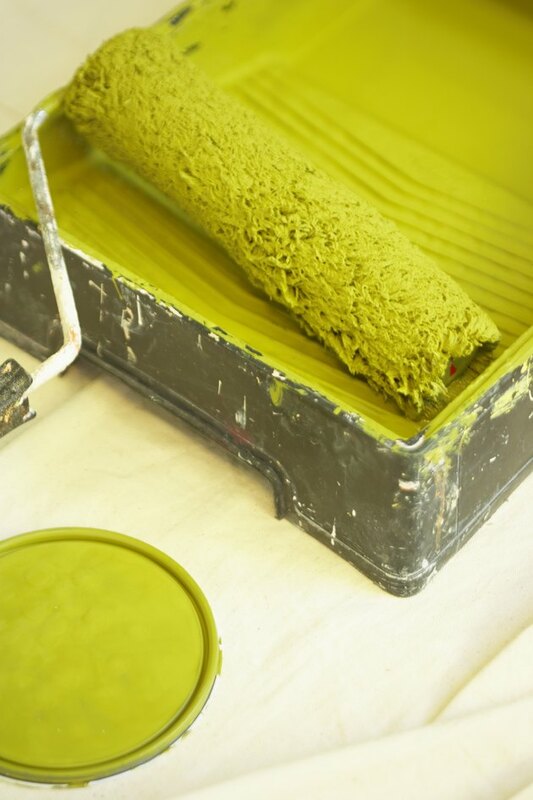 If you choose to glue the roller -- which is a last resort -- prepare the roller about 30 minutes before you're ready to paint to give the glue time to set. Because the handle of a roller is U-shaped, the side closer to the handle gets pushed down harder, leaving the other end of the roller free to slide off. You can counter this tendency by adjusting your grip to apply pressure more evenly while you're painting. This is actually easier to do when you're using a pole. Angle the pole slightly toward the free end of the roller, and the sleeve should stay put.